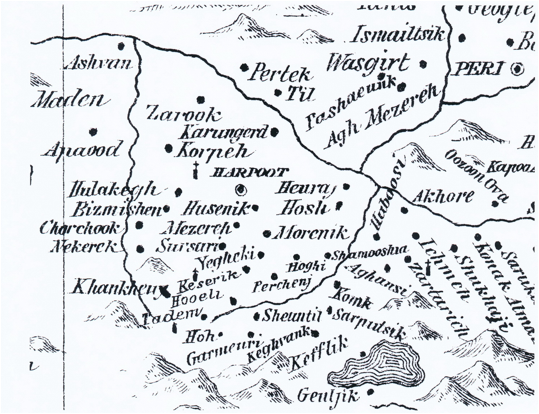 Our latest posting entitled A Family Photograph from Korpeh, Kharpert, Old Armenia Bears Forceful Witness to the Genocide (http://www.groong.org/orig/ak-20150710.html) has already elicited questions from family and friends about why the maps that included names of the various villages on the Kharpert plain could not have been larger to facilitate more ready examination. We now post five maps that hopefully will be more readily examined. Below we try to accommodate that request. It may perhaps be useful to see a map showing how the American Board of Commissioners for Foreign Missions subdivided the Asiatic Turkey into the Western, Central and Eastern Mission Fields. The map may be found in Rev. Dr. Joseph K. Green’s Leavening the Levant (The Pilgrim Press, Boston, 1916, facing pg. 2). A copy available to us includes some annotations by hand­­­­­­­ and provides comments on mineral resources. 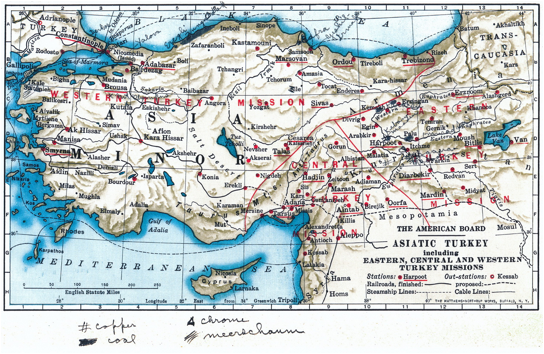 (The map of the “Fields” has added relevance for our July 4, 2015 posting of The American Missionaries in the Ottoman Empire before, during and after the Turkish Genocide against the Armenians: Towards a detailed accounting of ‘who was where and when.’ A list prepared for Ambassador Henry Morgenthau by William Wheelock Peet, Bible House, Constantinople dated 7 October 1914 by Eugene L. Taylor and Abraham D. Krikorian. http://www.groong.org/orig/ak-20150704.html ). 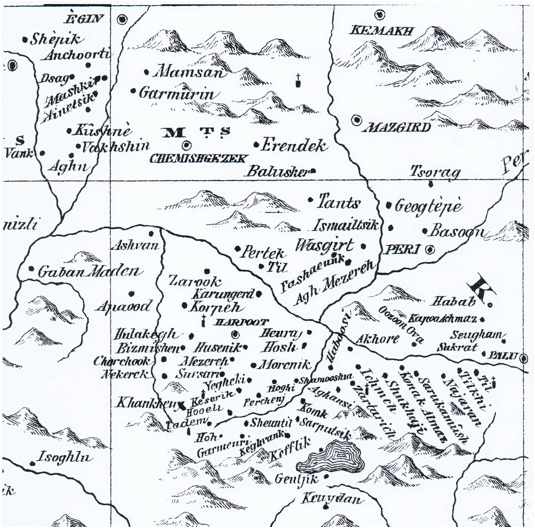 Another map that will assist the reader to get oriented at a different level is added as well. 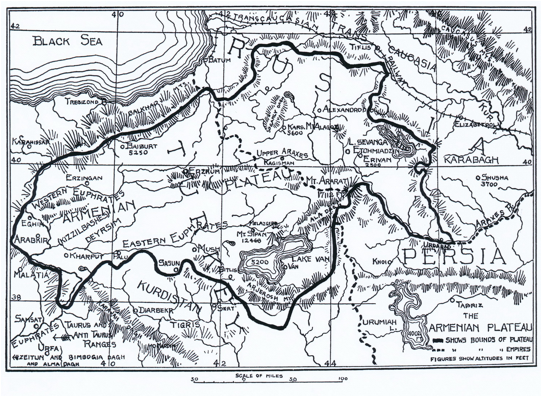 Kharput is seen on the lower left hand side within the general boundaries of the Armenian Plateau. 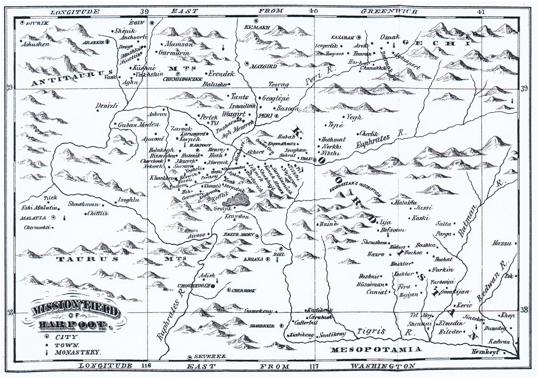 This map was scanned from D.S. Gregory’s The Crisis of Christendom; or the Eastern Question from its Origin to the Present (1900, The Abbey Press, New York, facing pg. 42). The other maps will be recognizable from our earlier posting but we also provide a few close-ups for enhanced viewing. They are from Crosby H. Wheeler’s Ten Years on the Euphrates: or, Primitive Missionary Policy (American Tract Society, Boston, 1868 facing pg. 38; total length of 330 pages). (Incidentally, the same map also was published in Rev. Wheeler’s Letters from Eden, or Reminiscences of Missionary Life in the East, American Tract Society, 1868, Boston, facing pg. 118; total length of 432 pages).